De Heeren van Liedekercke began life in1991 by Joost De Four together with his parents. Originally intended as a beer café with a few dishes on a menu, although with 150 beers on offer was exceptional for those times. Beer was not yet appreciated as it is today.. In 1993 Tom, Joost’s brother joined the business paying special attention to the kitchen and restaurant. The young chef took his time experimenting with beer, sauces, marinades, jellies, vinaigrettes, foams , desserts, etc… Clients enjoyed the fruits of his labour in the classic beer cuisine and the creative suggestions. In 1998 the brothers took over the business and it underwent a transformation. 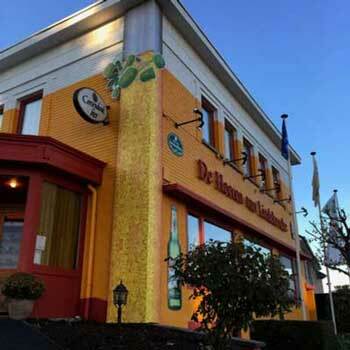 From now on De Heeren became a synoniem for “bierrestaurant” and served a complete gastronomic menu on the basis of beer. Beer and foodpairing is now a known phrase although there are still too few who do it. De Heeren are sometimes known as the pioneers of the beer cuisine..
‘De Heeren van Liedekercke’ is therefore foremost known as a restaurant today, however, the traditional place to be for a good glass of beer is still top of the agenda. de Heeren give all their attention to the small brewers. In 1993 De Heeren launched the Heerenbier. In those days brown beer was considered to be sweet so the Heerenbeer was a real revolution, a dark beer that is strong on hops and dry-hopped was very unusual.. In 2016 the De Heeren is 25 !! Many special things will be done throughout the year and they started with a makeover for the exterior…the eye catching finish does indeed represent a glass of beer with its foamy topping !! As with all good birthday festivities a good beer is needed, there is a big chance of a second anniversary blend being produced towards the summer..
Why also launch a Gin? With the creation of HeerenGin the 25th celebrations continue, Joost explained they were already Gin lovers and wanted to create something unique for themselves.. 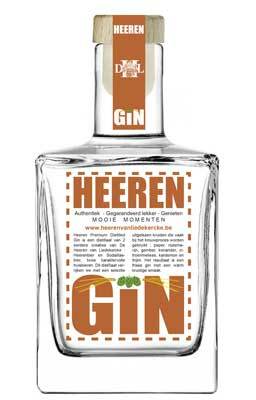 Many believe the current Gin hype is already passed but not those at the Heeren. Indeed a huge growth is no longer expected although De Heeren are convinced there is always place for something with an original tint. A product based on quality and using local produce. The use of the ‘house beer’ guarantees quality, is more than original and therefore becomes an amazing local product. Luc Waterschoot from the traditional distillery VDS in Aalst was well known to De Heeren and both parties had the urge to create something different. Luc found the idea of a Beer Gin a real challenge. The development was in several stages with the quality of the distilled beer paramount. 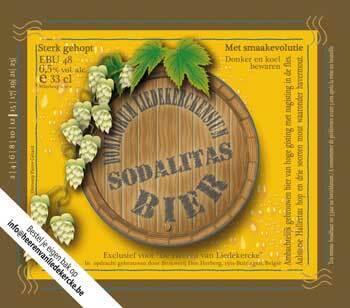 A blend with Heerenbier/Sodalitas created the perfect base with their distinctive herb blends. Tasting, tasting and yet more tasting followed to perfect the blend. Luc was so enthusiastic to have discovered this basis and was excited at the prospect of finally producing the Gin. De HeerenGin is most defiantly classified as a local product with the following criteria. 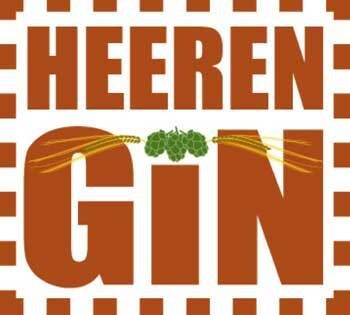 De HeerenGin is a real Gin with no commercial interference. Neutral grain alcohol with the dominant jenever is the basis. The distiller then becomes a ‘botanist’ to achieve the required blend.. 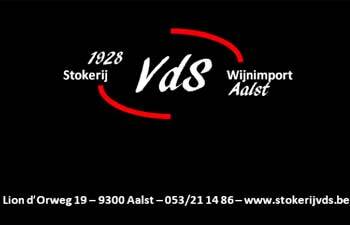 The distillery began in Aalst in1928 by family Van der Schueren and specialised in strong local products, Jenevers, liquors and aperitiefs. In 2001 Luc Waterschoot took over with the addition of the staff, recipes and the good name for fruit jenevers from the Cockney’s Distillery, a Gent firm since 1838. 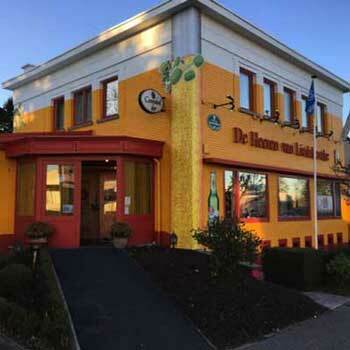 The business continued to grow and moved premises in 2015 to de Lion d’Orweg 19 in Aalst with a bigger shop, tasting area, and most importantly a larger production area. Distillery VdS has specialised in the production of special, private labels with many co-international productions with countries charmed by our Belgium distilleries. Belgium Jenevers are the forerunners of Gins which encompassed the world and the worlwide search for quality products means new creations can be launched. Most famous today is the Cockney’s gin, a project wherein the the oldest Gin in Belgium was given a facelift with the assistance of three local businesses. Also Belgin, a range of premium Gins with typical Belgian roots such as hops (Belgin Fresh Hop), fresh herbs from the abbey gardens (Belgin St Cruyt) and fresh Belgian raspberries(Belgin Raspberry). 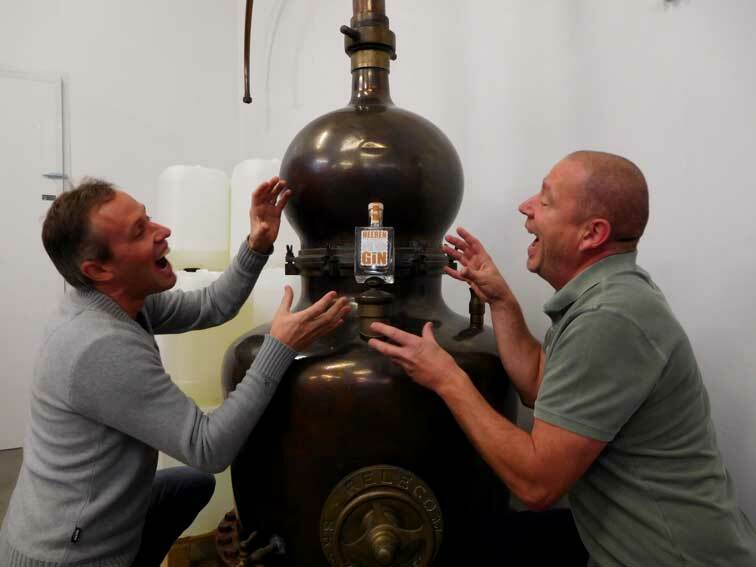 Luc : “The project with ‘De Heeren Van Liedekercke’ is something that interested us from the beginning, authentic story and a professional partner who knew what they wanted The first trials with Sodalitas and Heerenbier showed immense possibilities for a unique Gin. With the addition of typical ‘beer’ herbs, rosemary, cardamom, thyme, coriander etc, we came to a perfect balance between both beers and achieved a subtle flavour with citrus tones. “Dominorum Liedekerckensium Sodalitas” is the full name but a lot easier is Sodalitas !! Sodaal is from Latin and means ‘someone who likes a drink’. It is an unfiltered , light blonde beer with a full flavor despite its lower alcohol percentage. With a very bitter aftertaste from the use of hops from the variety Hallertau and strongly dry hopped. Under the lovely white foam is a complex, fresh taste with the scent of hop flowers, malt, herbs, and soft pepper. Indeed it is a superb hp tasting beer which is bitter in the mouth with a lovely dry aftertaste. 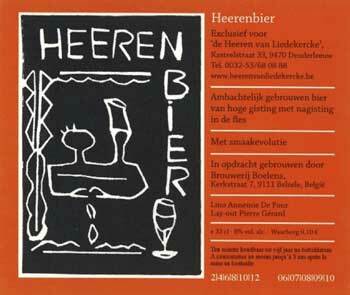 Exclusiv brewed for‘De Heeren’ by brewery Den Herberg, Buizingen, 6,5 vol. % alc. Exclusive brewed for ‘De Heeren’ by brewery Boelens, Belsele, 8,5 vol. % alc. Sodalitas and Heerenbier with very distinctive pallets of flavours, ideal to distill. The Gin is refined with additional herbstypical for beer, rosemary, cardomon, thyme, coriander etc and of course black pepper. Result was an excellent balance of flavours with a hint of citrus. 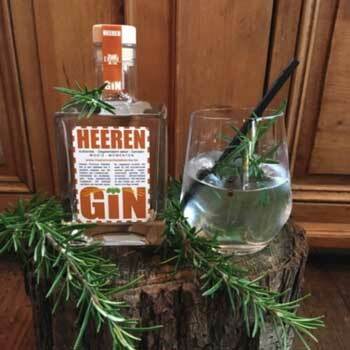 Heerengin, is a powerful Gin that due to its original formula is a little different and very pleasing to taste. 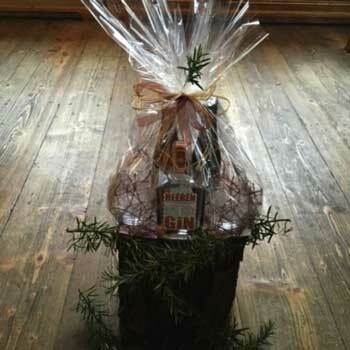 Exclusief distilled for‘De Heeren’ by distillery VDS, Aalst, 44 vol. % alc. The peppery character can be accentuated with the addition of 2 Timut peppers.and to add boost 2 Jamaican peppers, the combination work well together, it is a subtle aroma and the maceration in the Gin gives an almost grapefruit like citrus flavor. To finish use a a little rosemary. G&T needs tonic..although people tend to use too much. An ideal combination is the Premium mixer from Schweppes, and with slightly more character the Pink Pepper and Ginger and Cardamom varieties. With so much attention given to the basis, the Gin is also fantastic to drink neat without being to harsh. The whole drinking process with HeerenGin is a pleasure, the design of the bottle, the top, the label all add to the ambience. Also available on our website are the stockists and cafés where the Gin can be tasted, it is proving to be a real success. AND OF COURSE HERE AT THE De Heeren van Liedekercke! So why are the brothers laughing….?? Too many samples along the way, scared they would drop the first bottle, getting to close to the hot distilling kettle or a good joke from Luc the distiller…!! Or just desperate for a HeerenGin ! *English version for information only and is not intended as a direct copy of previously published Nederlands version.